It’s true, contactless payments are on the rise! Clearly contactless isn’t a fad, but something that is sticking around – the great news is, your nimbl cards are contactless, so when choosing to spend wisely you can join in on this ‘tap and go’ craze. To keep your money safe there are a few things to remember when using contactless. Currently payments are capped at a £30 spending limit in the UK, with the emphasis on convenience rather than using the service for larger payments. 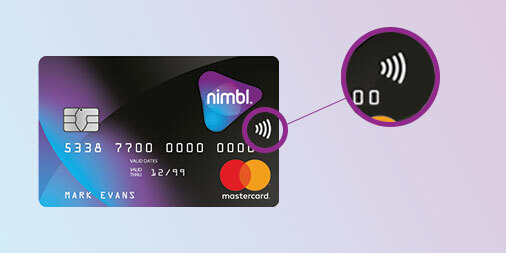 Also, for the first time that you use your nimbl card, the contactless is disabled – and for security reasons you will need to make one transaction using your PIN number before contactless is enabled on your card (this is our way of making sure you have received your card). Then hey presto, your nimbl card is ready to go and enter the world of contactless payments! Occasionally, you may be asked to enter your PIN number as a security measure to verify that you (the registered card holder) are still in possession of your card. How can I start using my contactless nimbl card? Use your new nimbl contactless card with your PIN at least once for a payment (our way of making sure the right person has the card) then follow the steps below to start making contactless payments. 4. The reader will confirm that your payment is approved. There are numerous shops, restaurants and cafes which already accept contactless payments and the list is growing. Just remember to look out for the contactless symbol when making a payment using your nimbl card. So have fun and spend wisely when using contactless!